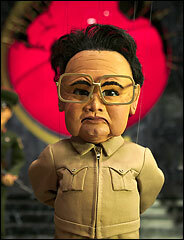 North Korean Daffy-Duck fan, Lamborghini aficionado and fascist maniac Kim Jong–Il has been a busy boy lately. With the launching of short range missiles on Memorial Day, an underground Nuclear test, and the blatant kidnapping American journalists (ironically employed by an agency owned by Al Gore), it seems Dear Leader is a little… ronery? Or maybe it’s just that Arrec Bardrin is worthress.Who knows why… but the important question is, what is Obama doing about it? Well, pretty much, nothing. He just loves appeasing Dear Leader! Basically this is what Obama “strong” and “well thought out” defense against North Koreans is a letter to Pyongyang telling the DPRK how angry and upset they are… Well call out the parades everybody! Obama is saving us! HOPE AND CHANGE!